402 pages | 3 B/W Illus. In the last 30 years, a distinctive intersection between disability studies – including disability rights advocacy, disability rights activism, and disability law – and disability arts, culture, and media studies has developed. The two fields have worked in tandem to offer critique of representations of disability in dominant cultural systems, institutions, discourses, and architecture, and develop provocative new representations of what it means to be disabled. 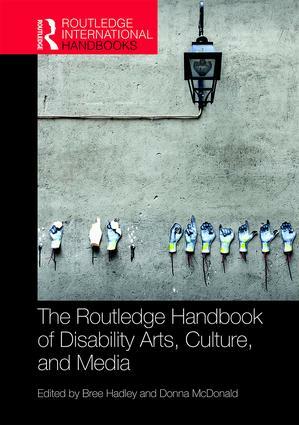 this handbook brings disability arts, disability culture, and disability media studies – traditionally treated separately in publications in the field to date – together for the first time. It provides scholars, graduate students, upper level undergraduate students, and others interested in the disability rights agenda with a broad-based, practical and accessible introduction to key debates in the field of disability art, culture, and media studies. An internationally recognised selection of authors from around the world come together to articulate the theories, issues, interests, and practices that have come to define the field. Most critically, this book includes commentaries that forecast the pressing present and future concerns for the field as scholars, advocates, activists, and artists work to make a more inclusive society a reality. Bree Hadley is Associate Professor in Drama at Queensland University of Technology. Her research on representations of disability in contemporary, pop cultural, and public space performance, and spectators’ responses to these representations has appeared in Theatre, Social Media and Meaning Making (2017), Disability Public Space Performance and Spectatorship: Unconscious Performers (2014), and numerous performance and media studies journals. Donna McDonald is an Adjunct Senior Research Fellow with Griffith University, art therapist and artist. Her publications include two books, Jack’s Story (1991) and The Art of Being Deaf: a memoir (2014) and chapters in several books including Complicated Grief (2013), Deaf Epistemologies (2012), Literature and Sensation (2009), and A Revealed Life: Australian Writers and Their Journeys in Memoir (2007). McDonald regularly exhibits her paintings and mixed-media works in art shows.